More than 90 cars were damaged in just one night on the streets of Inverness. 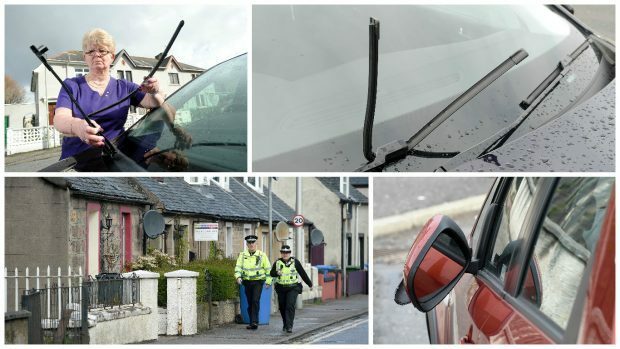 Motorists were left counting the cost after wiper blades were torn off or mangled – while some other vehicles had their wing mirrors broken off. The incidents happened in a handful of neighbouring streets in the Dalneigh and Merkinch areas of the city. Police confirmed last night that a 42-year-old man has been charged in connection with the alleged vandalism. The inspector leading the investigation confirmed that officers are continuing to make inquiries and urged anyone with information to make contact with police. Police yesterday were conducting door to door inquiries in the area.The trail of the damage spread along Telford Road, Telford Street, Telford Gardens, Dochfour Drive and Skinner Court. Residents woke up to the vandalism spree yesterday morning. One of the first to spot the damage was Telford Gardens resident Linda Christie, who saw that the wiper blades on her husband’s car were bent and broken at about 2.30am. She said: “I couldn’t sleep so I was up and that’s when I looked out the window and saw what had happened. “I called the police about it. I didn’t realise then that the whole street had had the same thing. Several vehicles could be seen sitting on the streets with their windscreen wipers twisted and broken, while others had their wing mirrors broken off. One family had three of their vehicles parked outside their property damaged – two cars and a van – including one parked on their driveway. A woman, who asked to remain nameless, said: “I was shocked. My husband saw it when he went outside about 7.45am. Many of the damaged cars had been already been moved yesterday, with some already having been taken for repairs. Dell McClurg, chairwoman of Merkinch Community Council, said: “It’s a sad thing to have happened. “I just feel sorry for everything that’s been a victim and hope they are able to get things sorted out quickly. Local councillor Bet McAllister said problems with vandalism was a regular concern raised around the area. She said: “It’s absolutely horrendous. “It’s a very disappointing that this has happened and I fell for the residents who have been affected. Police said they have had reports of “more than 90” vehicles being damaged overnight. Inverness-based Inspector James Rice confirmed last night that a 42-year-old man had been charged.